The Global Leadership Summit (GLS) is a two-day conference designed for anyone with influence. Parents, educators, students, medical providers, business people, social servants, volunteers, and everyone in between will find value in the wisdom of the nearly two dozen presenters speaking at this year's Summit. Watch the video below or click the image to learn more about the faculty line-up for 2018. Click here to get more information. 2018 marks the third year the University Church will host the event as a premier downlink site. Attendees in College Place will enjoy the content via live-satellite feed from Willow Creek Church in South Barrington, Illinois. More than 100 people attended in each of 2016 and 2017, soaking in the world-class material and being inspired. We are excited to host many people from the Walla Walla community this year, including business owners, educators, and leaders from Providence St. Mary Medical Center. GLS takes place on Thursday and Friday, August 9–10, from approximately 8:30am–4:30pm. University Church members can still receive the special rate of $119 all the way up until beginning of the summit. Register here on our website or by filling out a paper form located at the information desk. Full-time college/university faculty, students, and staff, as well as active military, are entitled to $89 pricing, even up until the day the summit begins! Please join me in thanking our musicians. Matt Heinrich, from the University Bookstore, leads the praise band; Arely Hernandez-Cruz, a 2018 summer graduate, plays flute; and Sam Derting, from College Place High School, (and the First Serve music coordinator) sings. 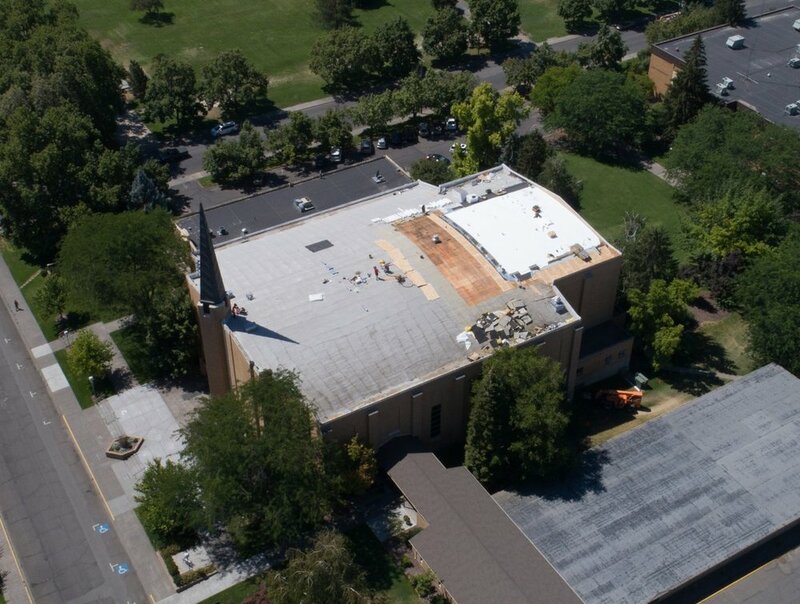 The University Church has embarked on a large project of re-roofing the Sanctuary. This will be the first time since the facility was originally built in 1962 that the entire surface will be replaced. Elsom Roofing is leading the effort which will stretch through the end of August. The total cost will be over a quarter of a million dollars. Your contributions to this project will allow us to keep in hand some of the depreciation and reserve funds that careful fiscal responsibility have accumulated over the past decade. If you are inspired to give specifically to this, please mark your tithe envelope "church roof" or in the Online giving portal, click "more offering categories" and then type "roof" in the box. Thank you for your generosity to the ministry of the University Church! 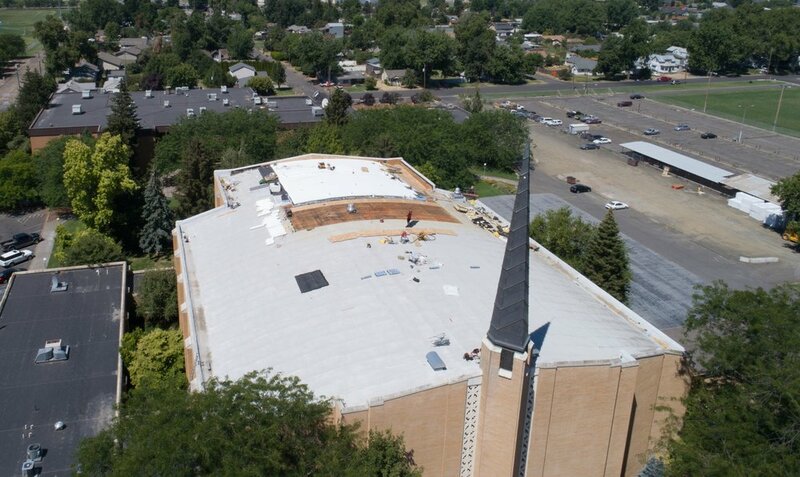 Pictures and video of the roof replacement process are posted here in the Bulletin, scroll down to "Touches of Interest" to view. Thank you to Chris Drake for these! Check back regularly to see updated images as the project continues. An all-church pancake breakfast is planned for next Sabbath, August 11. The Jr. High Sabbath School class invites you and your family to breakfast in the Fellowship Hall, 8:30–10am, before Sabbath programs begins. You are invited to join the whole church family for food, conversation, and a great beginning to the day! Dentist needed three days a week at SonBridge Dental Clinic. This is a paid part-time position. Call Mel Lang at 509.301.3460 if interested. The sister of Darold Bigger, Sandi Carlson, lost her battle with acute myeloid leukemia on Wednesday, July 25, in Walla Walla. She is survived by her husband Rick Carlson and her children Scott Carlson and Noelle Conners, all from the Portland area. A service is being planned here in Heubach Chapel on August 12, at 1:00 p.m., with a graveside service following at Mt. Hope. (this position is responsible for taking record and supervising the classroom until the period ends. This position will encompass 5-6 hours per day on Mondays and Wednesdays) and a work supervisor (responsibilities include supervising up to 10 students for approximately one hour Monday through Thursdays. Transporting students with school transportation to a local retirement center. Completing paperwork required by the grand for the organization subsidizing the program. The program should take a supervisor approximately two hours per day.). If you are interested in either, please call Steve Fuchs or Brian Harris at 509.525.1050. Cindy Tutsch, a seasoned speaker who has shared the gospel around the world in over 60 countries. Register online at: uccsda.org/WomenRetreat2018 or by calling Wendy (afternoons only) at 509.838.2761. Eqypt Bible Tour is December 12–22, 2019. You are invited to join Dr. Carl Cosaert of Walla Walla University to discover the land of the pyramids, the pharaohs, Moses, and the Exodus. $2,425 plus airfare includes meals and accommodations. For more information, contact Sharon Searson at Sharons@uccsda.org.